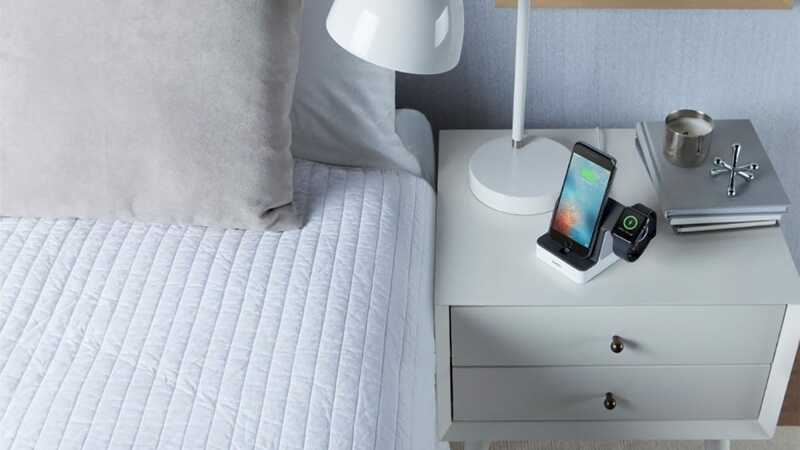 Just because you’re deep into the Apple ecosystem with an iPhone, Apple Watch, and–maybe–even some AirPods, that doesn’t mean your nightstand or desk has to be a cable cluttered mess. These combination charging stands will keep things neat and tidy. If you’ve just bought a new Apple Watch, you need somewhere safe to charge it. It’s possible to just plug it in and leave it on the side, but where’s the fun in that? A more stylish solution is to use a dedicated charging stand, and we’ve tracked down the best of the bunch. Now at the end of the day you can take off your watch, pull your phone out of your pocket, and park them in the same place to charge. One of the cheapest stands here, the Orzly DuoStand Charge Station makes good use of its small footprint. Simply place either your Apple Watch or iPhone at the front, and the other device slots in behind it. It’s up to you which device you want to make most prominent, so this doubles up brilliantly as a bedside stand. It’s compatible with all sizes and models of Apple Watch, as well as all types of iPhone, so there’s no need to replace it when you upgrade. It should even work for most other smartphones, given how it’s designed. Cables are neatly placed hidden away behind your devices, so this stand will fit into your decor pretty well, without looking out of place. 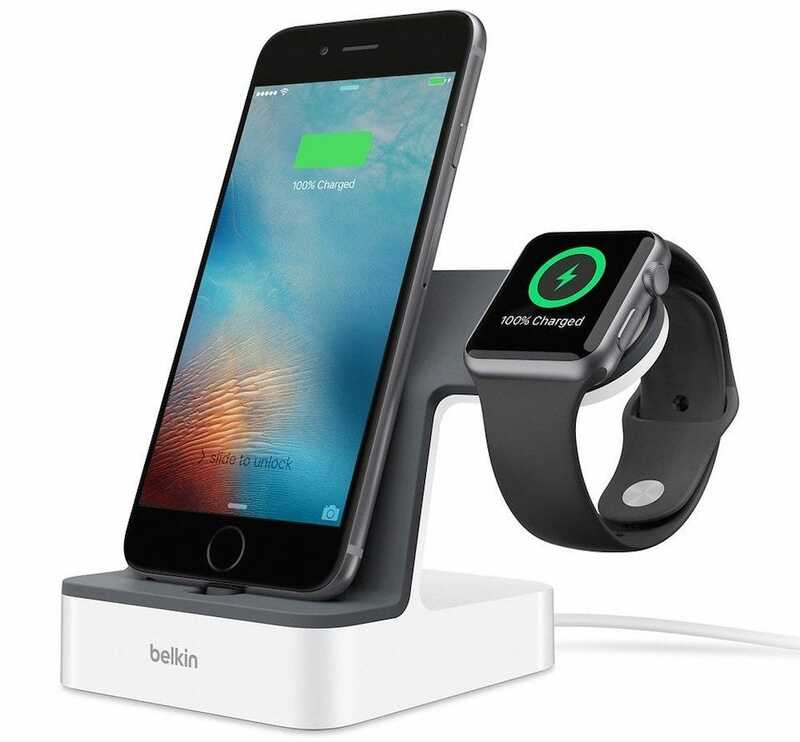 The JingooBon iPhone and Apple Watch Charging Stand looks like a little abstract aluminum mountain and is perfect if you have multiple Apple devices. That’s because it charges not only your iPhone and Apple Watch, but also your AirPods. Each device has its own place on the stand with the Apple Watch highest of all, so that you can clearly see what time it is if you use your Apple Watch in nightstand/alarm mode. It’s fairly stylish with multiple colors available if you wish to match it to your iPhone. It’s compatible with all Apple Watches, AirPods, and iPhones, including the iPhone X. It’s worth noting that the Qi charging only works with the iPhone 8/iPhone X models (with older iPhones you’ll have to plug the charging cable for the Qi pad into the phone itself). 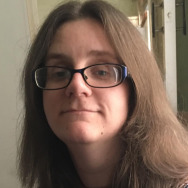 It’ll also work with any other Qi-enabled devices, such as the Samsung S8. Its versatility is what makes its price point quite reasonable, plus it comes with Lightning and Micro USB cables. It’s a great addition to your desk or nightstand. 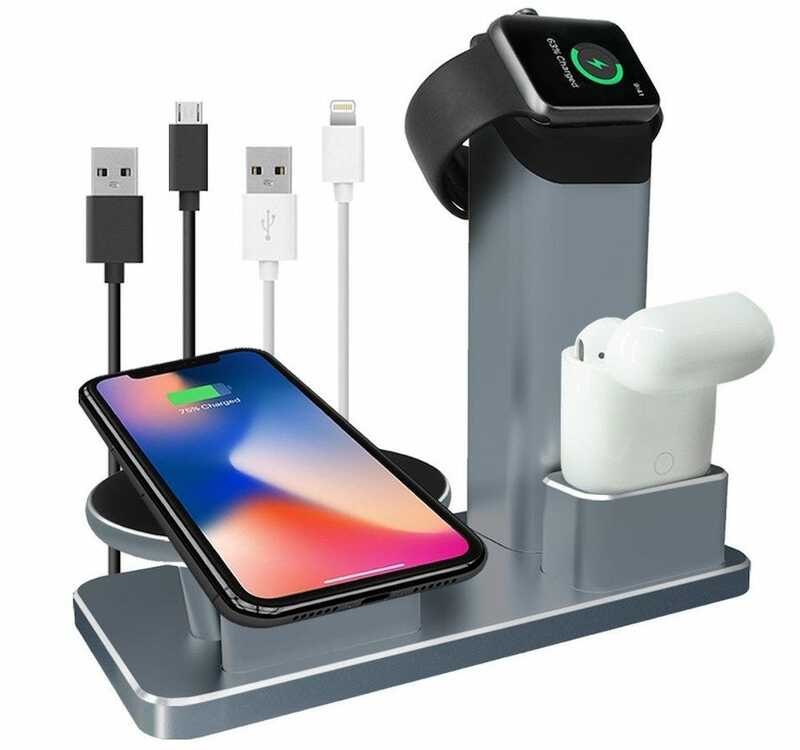 The ZVE Universal 2 in 1 Aluminium Desktop Charging Stand is quite hefty which means it’s a perfect fit for your desk rather than your nightstand. 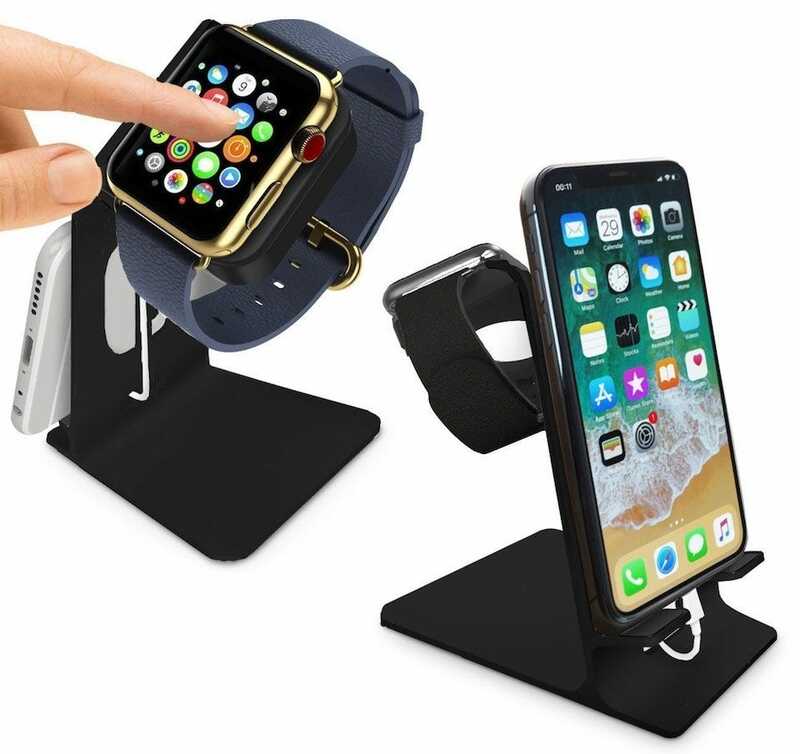 The stand is able to hold your Apple Watch as well as your iPhone or tablet, depending on what you want to use it for. It holds a tablet up to 12.9 inches in size so it’s great for the majority of tablets out there. Rubber pads and feet protect your devices from scratches or sliding, with it possible to rotate your phone or tablet horizontally or vertically, depending on what you need to do with it. In terms of style, it’s simple to slot the cables to the back of the stand, ensuring a cable-free appearance. The ability to work with a majority of smartphones— not just iPhones—makes it very flexible. Just make sure you have plenty of room around it to get the most out of it. The Belkin PowerHouse Charging Station is the most expensive charging stand here, but it’s also the most straight forward. Its base looks much like any official Apple product, fitting the Apple aesthetic very well. Simply slot your iPhone onto the stand with the Apple Watch to the side, and that’s it. It’s minimalist yet everything you could want from such a stand. There’s a built-in Lightning connector for your iPhone, along with a built-in Magnetic Charging Module for the Apple Watch, so there’s no need to worry about cables sticking out awkwardly. An adjustable dial raises and lowers the connector so if you have a case wrapped around your iPhone, it’ll still work great. Sure, it’s expensive but if you want something that just works, this is the stand to go with. It’s well built, sharp looking, and flexible. Looking at all the other stands and hate the plastic and metal themes? 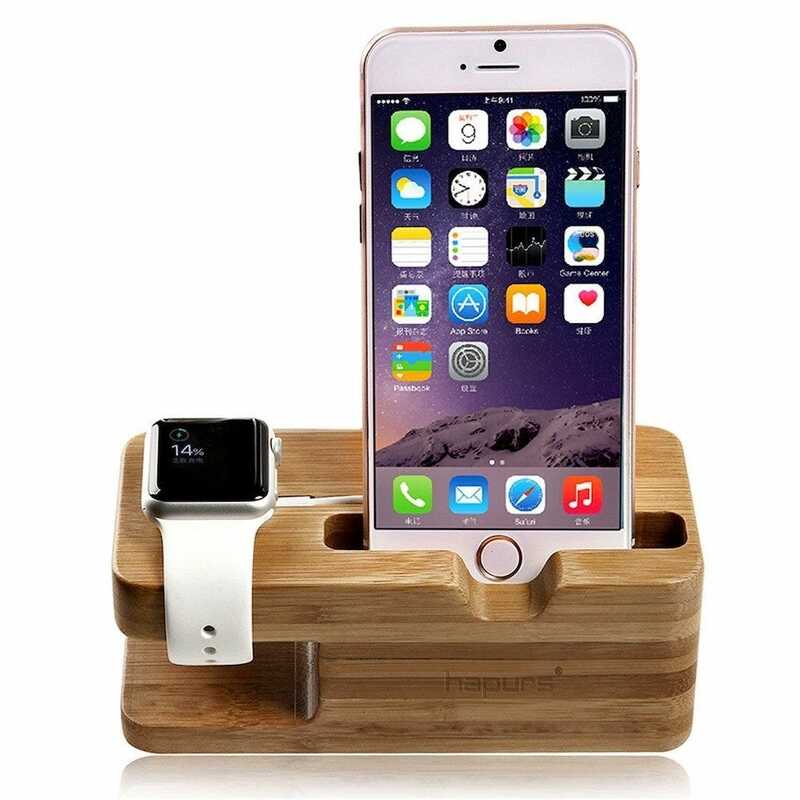 If you’re after something more traditional looking, the Hapurs Apple Watch Stand is the one to go with. Made from natural Bamboo, the stand ditches the plastic/metal look for a more rustic and natural appearance. It’s a decent weight and a solid build, so it’ll fit on your nightstand or desk perfectly without any risk of falling. Because it’s made from wood, there aren’t any rubber pads or magnetic sockets to keep your devices snug, but that’s ok. Instead, slots have been carved out so that your Apple Watch and iPhone fit perfectly into the stand, resting comfortably until you want to use them. The smartphone slot also works for any other smartphone, providing it’s under 5.7 inches, with analog watches also easily fitted on the stand. Charging slots ensure that your cables are tucked away discreetly. It’s great for if you want something a little different from the rest. 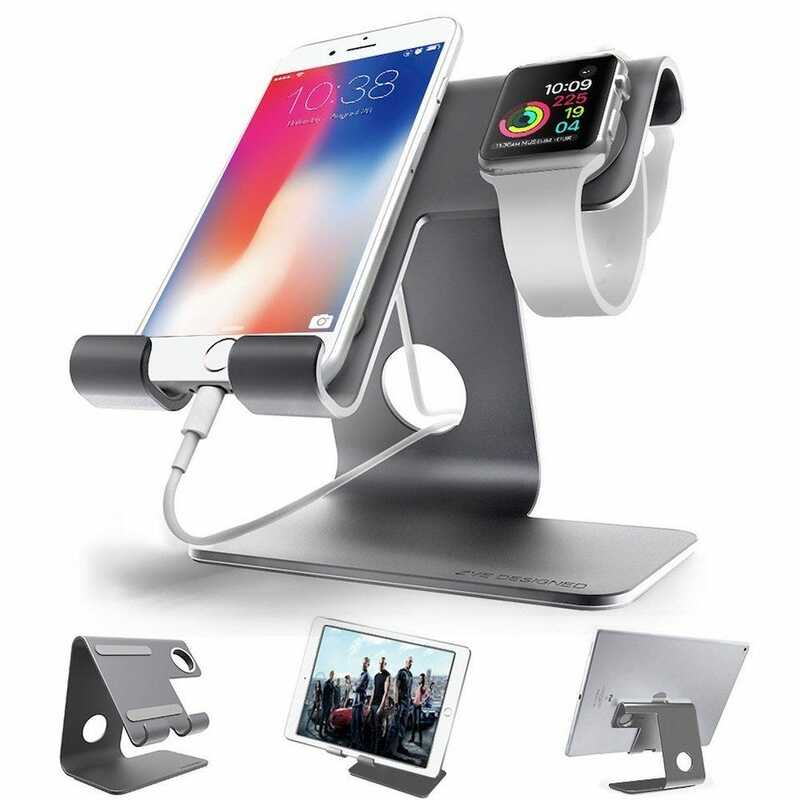 It’s perhaps not the most stylish of options out there, but the XUNMEJ Apple Watch Stand Station is pretty useful. 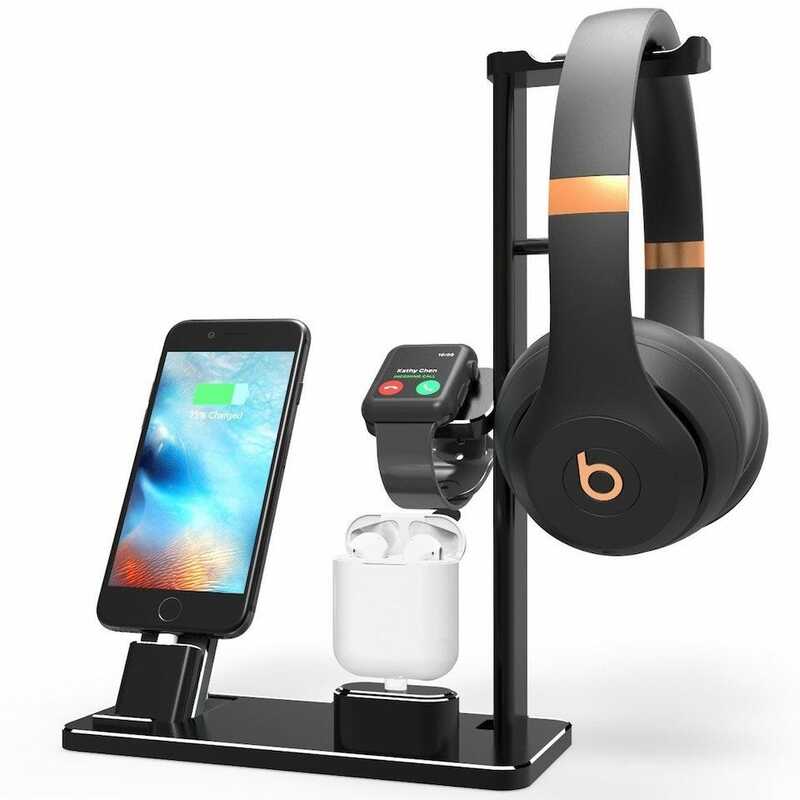 Designed with multiple devices in mind, it offers a place to put your iPhone, Apple Watch, earbuds, and headphones. It’s the kind of stand you can put in a prominent position in your house then grab relevant items just as you’re walking out the door. No cables are included but it’s easy enough to slot them in without making things look messy. Each part of the stand has anti-slip rubber and other components to ensure that none of your devices can be scratched. It’s possible to rest many different kinds of headphones, as well as necklaces or other jewellery. It’s sturdy enough to support smaller iPads too. It’s versatile and ideal if you have plenty of things to charge at once.